Okay, it's been about 3 years since you've heard from me so you might be surprised to learn that in this time I've become a very (very) experienced runner and ultra-marathoner. I've got at least 5 or 6 medals somewhere in the back of my Honda Fit an I'm about to drop you some k-nowledge. For the last three months you've struggled to train through New England's worst winter ever (since 1996), read countless articles on the web, perhaps even received a copy of the coveted John Hancock Life Insurance Official Training Guide to the Boston Marathon (tm) and somehow convinced yourself that running 3 times per week with some cross training thrown in, cross training that included, well, not doing anything other than eating poorly and drinking too much actually, will make you "run less run FASTER" (TM) and be prepared for 26.2 grueling miles. Congratulations! Put all of that aside. You are about to get the best advice you've ever received about running the Boston Marathon. Once you arrive at the starting line you'll have a good 5 or 6 hours to wait around in the cold and ask yourself why you decided eating nothing but pasta for the past 4 days and drinking 80 ounces of water on the bus ride to Hopkinton was a good idea. Also you will start to doubt your ability to run at all. For any distance. Cause, really, if you think about it, you shouldn't be here. What did you do to deserve this? Not much, really. You likely didn't qualify for this race and you just nagged your friends and family for donations for the last 3 months to buy yourself a number. Good luck asking for any favors ever again. BANG! you're off! Just another hour or two as you wait for the throngs to get across the starting line. By now you've probaly heard that the course is net downhill; much like your life. There's really not much more to live for. This was your "big goal" for quite some time now and, honestly, no one else really cared. Except for Aunt Nancy who got food poisoning at your spaghetti dinner fundraiser at Vinny Testas. If you do decide to run another marathon it will be much less of a milestone. If you don't, then what was the point? I always tell first timers at Boston to make sure you ENJOY THE EXPERIENCE! Take advantage of this now cause the first few miles are the easiest, have the steepest drop in elevation, and you'll probably do some serious damage to your quads which you won't notice until much later in the day when the crowds are thicker and the audience for your embarrassment is much more captive. Between miles 7-8 you'll conveniently find a series of porto-potties just past the water station. This is a good place to make your first stop. Hop in that little green tardis and have yourself a cry. It's cathartic. It doesn't matter what you focus on. Your tears don't care that you have another 18+ miles to go. It will be hard to breathe through all that snot and your runny nose for the next few miles. But don't worry, no one will notice. They will be too busy passing you by. It's here that you start to realize you are not even a "mid-pack" runner and the futility starts to set in. Along with the delayed onset muscle soreness. And those first bits of fear. Another opportunity to enjoy the race, the Girls of Welsley should be around the corner. They tell you you'll get chills when you hear them cheering half a mile before you see them. Unfortunately for you the chills are the first sign of hypnoatremia. And that wall of sound is really kind of an annoying shriek. And how can anyone respect these entitled private school kids who never had to do anything to get to their privileged place in life. Yay! Heartbreak Hill! You'll be walking most of the time by now so it will take you quite a while to get to the top of this "Monument of Boston" that's actually not much more elevation than a typical freeway exit ramp. Plenty of time to think about how in middle school science class you made Jason Z. think he was color blind by asking him to identify a color on a piece of paper and then showing your science teacher a completely DIFFERENT block of color, causing a whole situation where a slew of nuns and a "nurse" had to get involved and there was all this mimeographed (it was the 70's) paperwork going around and then Jason ended up in public school and you didn't have a "best friend" anymore. Whew! You made it to the top. Does anyone else think it's weird that weather-ladies on TV are preggo all the time? It's all good from here on out as you come through BC and turn the corner at Cleveland Circle! Why are you such a failure? Not just at running, but at everything? You're in kind of a daze doing that run, jog, walk thing. The crowds are still out cheering but the guy you are racing down Beacon has a broom and is sweeping up trash on the side of the road. This is such a selfish pursuit. Think of the countless hours you've spent training, alone, with no benefit to anyone, least of all yourself. There's Fenway park, there's Hereford, and you hiccup as you come down Boylston. And you hiccup. And they continue. But it's okay, an esophageal surgery at age 39 and a lifetime of medication will take care of that. Mostly. Good job kiddo! Back to your desk job on Wednesday, just another office jockey hoping for a new flavored k-cup in the 2nd floor kitchen. Better plan to get in early. 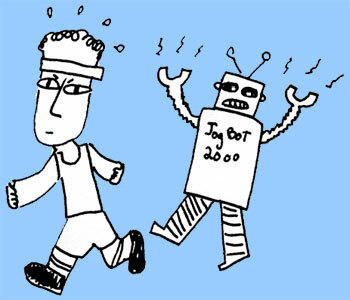 Thanks to Erik P. Kraft for the lovely "jogger being chased by robot" illustration! You can find Erik at erikpkraft.tumblr.com!